The Eagle reports that Ristorante Armando’s, a fixture, with one brief interruption, on Montague Street since 1936, has closed for good. Along with the loss of what, for many in the Heights was a favorite eating place and hangout, will come the loss of the iconic (What other word can I use to describe it?) lobster on its neon sign. Back in March of 2008, when owner Peter Byros (Did I catch im in the lower left corner of the photo above I took early this evening? I think so.) decided to retire, and the space was leased to a fast food chain, BHB’s beloved and sorely missed founder John “Homer Fink” Loscalzo started a “Landmark the Lobster” campaign. The lobster came down, but fortunately went to storage. It remained there only a little over a year, and returned to its place on Montague in July of 2009, when Mr. Byros decided to re-open Armando’s and put it in charge of his daughter, Maria Florea. According to the Eagle story, the restaurant’s closing was precipitated by the Byros family’s sale of the building to a real estate agent. 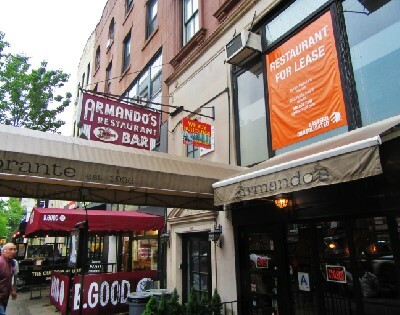 A sign in the window above Armando’s (see photo) says “Restaurant for Lease.” Maybe the new lessee will put up a new lobster sign (but only if Landmarks approves it). Meanwhile, across the street, as the Eagle story reports, Taperia has closed again. It’s “again” because, like Armando’s, Taperia was in its space before, then closed, and was replaced — all too briefly in your correspondent’s opinion — by an excellent Argentinian steakhouse. 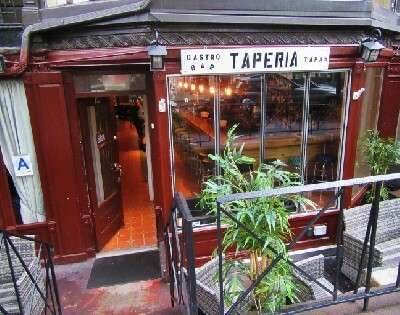 When that closed, Taperia returned, but its tenancy was brief. The spot seems cursed. So sad that I missed going to Armando’s one last time! They were always perfect for a summer evening. As a side note, that makes three restaurants at least, that have closed in the Heights in 2018 (Friend of a Farmer and Taperia being the other two). Armando’s is the only one I’m sad about though. Sorry to hear this. We always enjoyed eating at the bar and the food, though sometimes spotty was usually good, especially the lasagna. Always enjoyed going to Armando’s before Mr. Byros retired in 2008. Sunday brunch was really great. Only ate there once or twice after the daughter began managing the revival. Poor service and not great food caused me never to go back. What a shame. Armando’s was one of the classier restaurants on the street. With a few exceptions (Pinto, Teresa’s) Montague just can’t seem to hold onto decent sit-down restaurants. So much for soft-shell crabs and another icon of my childhood. I’m still getting over the loss of Parker’s drugstore…. In the days when I could eat this kind of food, I never went it because I couldn’t afford it. But I appreciated the place as one of the mainstays of Montague Street. Sorry that it’s closed. Incidentally, the new building owners have posted a sign, visible in the top photo, “We Buy Buildings.” Strictly illegal!